I have posted a bit about my cars in the past. Since my recently purchased 97 Civic DX will inevitably become a project, I decided to start a thread for her. Her name is Toshi ("mirror image" in Japanese). I had the same make, model, color, everything a few years ago when I lived 3000 miles away. This one is a little more beat up, and that is why it is a project. 139K miles, base model. Basically the whole thing has been neglected, but there is no rust and the engine runs strong. It is my DD! I bought her, because I wanted the legendary D16 engine. Entire Custom Stereo. Polk Audio 6.5 and 6x9 component speakers, 2 ten inch Infinity subwoofers (350RMS each), twin MTX AMPS one for each speaker. Trunk mounted second big battery. Looking good so far! You have been busy the past few weeks. Thank you, I have been super busy and I want Toshi to be mechanically tip top before I get suspension or anything else fun for her. Today I installed my $10 eBay short throw shifter. I adjusted the timing (it was way advanced). I installed some nice new Bosch wiper blades. I R2'd the slave cylinder and flushed the clutch fluid. Everything went in and out smoothly, the clutch feels much more crisp and solid, the short throw shifter is everything I hoped it would be. Next is finding the vibration when I brake (I suspect warped rotors). I also degreased a bit under the hood so it was easier to work on, and so it looks better. I ordered new pads and rotors for the front brakes. After doing some research I decided to just throw parts at the most likely issue. I know it could be the drums in the rear also. I ordered powerstop pads and rotors sold as a set for about $75 from Amazon.com. They are going on Friday. I finally did a thorough inspection of Toshi's undercarriage. I am not sure what it is called, but the big rubber bushings on the rear lower arms are deteriorating and will need replacement soon. And the shock bearings in the rear are rattling a bit. The vibration was from the rear drums being warped, they where in surprisingly good condition otherwise. They had no lip on them at all and the shoes where very worn, but evenly worn. 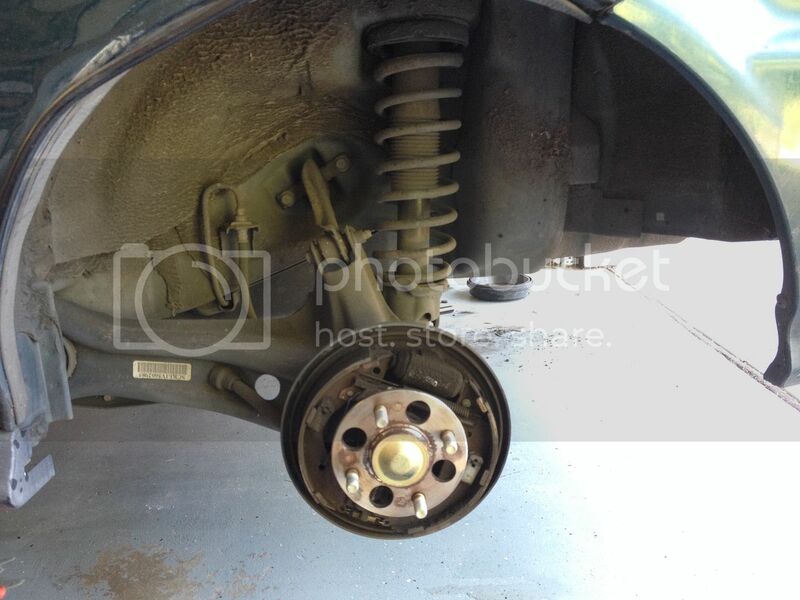 I am ordering a rear drum rebuild kit from rock auto for about $80. I put the new pads and rotors on because I had already bought them and the old ones where about 60% worn. Re torquing the lugs seemed to help the vibration a little, but it's still there until the drum kit arrives. I also want to flush the brake fluid, the lines look ok still. If I just lower it a inch or 2, do i need camber parts? what parts would I need if I did? Personally, I would install camber Arms, but it's not absolutely required. My friend's EM1 is dropped about 1.75" R / 2.25" F, on Neuspeeds. She has no tire issues, just more rear camber than front. Opposite of what you want for optimum handling. I'm not as well versed on EKs, but from what I know... there are complete front upper "wishbones" with camber adjustability or a replacement adjustable upper ball joints. Rears adjustments would be made with a new upper control arm. Good luck with the project. Keep us posted. Where do I adjust the fronts? I did't see a front adjustment, but I have missed them before. I saw the rears can be adjusted with spacers that they sell, or a new mount for the upper arm that sticks out more. Will those work? They do the right thing, but do they do it enough? Needless to say it did not last very long, but I ordered a $54 eBay tri-Y header to replace it. I think I will need a O2 emulator to avoid any codes on the downstream sensor, but we will see. The wire was never put back into the clamp and rubbed the insulation off a couple of wires. I will be fixing it on Wednesday along with replacing the rear brakes. As I predicted the fumes form the JB weld messed with the sensor. I reset it and will see if it comes back. I don't think you can adjust the fronts until you buy some aftermarket parts. As for the rear, I'd go with an adjustable arm vs. spacers. How many spacers / what size will get you to the camber you want/need? No idea. Like I said, I have a limited knowledge of the 6th gen. In the past year, I've installed engine mounts, struts/springs, rear lower control arms, sub-frame brace, headers, axles, brake calipers/rotors and bumpers. No idea about camber adjustments, except for what I've seen/read. Sorry. but a rear camber adjustment (more to positive side) does wonders to the piggy understeer issues that plagues FWD cars. I say piggy because the front tires will go squeeeeeeee, squeeeee, squeeeee! 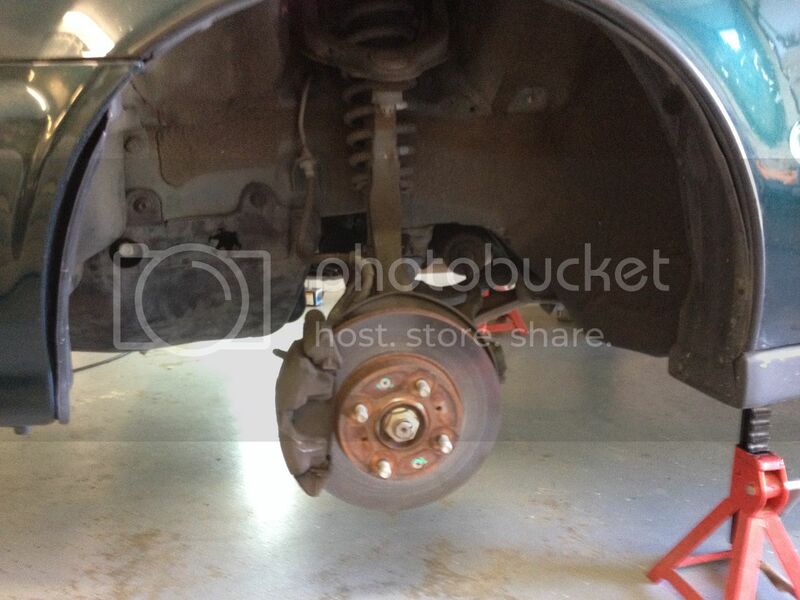 I did the rear brakes today. It went pretty smooth considering I haven't touched drum brakes in a few years. My header will be here on Monday. I reset the crank sensor code and it has not returned. The wires looked like they where still functional and might just need some insulating. She is now running pretty smooth, It does tend to have a fluctuating high idle when it's warming up, I am not sure what that is so I need to do a little research. It leaks where it connects to the stock mid pipe, I think I know how to fix it. Last edited by Mad Dog Tannen; 10-07-2015 at 07:16 PM. Looking good. Little stuff like that goes a long way. Headers look good too! This weekend was very busy for me. However I still got some little things done on Toshi. There was a exhaust leak on the cheap eBay header I bought, the two surfaces that meet at the coupler where not flat and leaked worse than the manifold I removed. However, this one was at a connection, not a crack. So I ended up throwing the gasket in the garbage and getting the highest temperature exhaust repair paste that I could find at Auto zone. I made a gasket out of it and cured it with a heat gun for hours. It worked great, no more leak during the 200 mile drive home. The DX does not come with tachometer, and I find it hard to hear my engine revs with the now sealed exhaust and booming stereo. ...So I ordered a cheap afterglow tach (because I can make it blue like the rest of my dash). The stick-on badges ("CIVIC" and "DX") fell off on their own, and I cleaned off the adhesive and foam residue. But the build up dirt deteriorated the paint down to the metal underneath. ...So I am going to seal it up a bit (so it does not rust) and hide it with a decal. Probably something to do with fishing. My tach came in the mail, it looks pretty cheaply made, but then again I don't need it to function, so I justify cheaping out on the tach. You are a busy man!! Thats a lot of projects that you have had. Hopefully soon I will have some to do some fun stuff like that. I only have the Civic and the GoldWing right now. One to drive, one to tinker on. and to think just a couple years ago people would talk **** about body kits and vented hoods being all show and no go and now hellaflush is in ??? In my opinion, both are pointless, and look ridiculous. I would rather not attract police attention. Quick Reply: Another project car.